"Their crystal clear and reptile fast sound with a furious dynamic power is something other manufacturers can only dream about"
"Your walls and roof disappear. It is like your room was built on music. You step right into the music"
"the musicians and vocalists are formed with a presence you thought was impossible with stereo. That’s a promise!" High End from mold to finished product. Molded from a strong durable plastic, sometimes called steel plastic, comes a perfectly shaped Bremen housing. 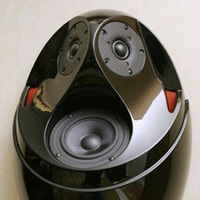 The Bremen 3D8 loudspeakers are moulded in a highly durable plastic called Dicyclopentadiene DCPD. The moulding process is called R.I.M. Reaction Injection Moulding. DCPD is widely used in very demanding environments. Volvo trucks total front part is moulded in one piece with DCPD. Caterpillar’s very large and three-dimensional hoods for its excavators. Large body panels for agricultural tractors and buses. Swimming pools because DCPD does not oxidize. DCPD does not crack when being struck by mechanical shocks such as polyurethane or other plastics do. Therefore it is sometimes called steel plastic. The high durability and high internal damping of DCPD together with a high density makes it the perfect plastic for the Bremen loudspeakers. In the moulding process DCPD is in the form of a two component liquid plastic with a catalytic system split into two parts. One two specific parts of the catalytic system are together with DCPD but split in two containers, each with a different compound. Both the DCPD monomer formulations are mixed together in a mixing head and then injected into the moulding tool where the curing will start leading to exothermicity with temperatures up to 270°C. The temperature is controlled within one degree C by liquid cooling channels in the tool. 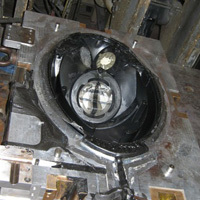 The moulding process for Bremen Loudspeakers takes place in a closed tool at medium fast cycle times, typically from 8 to 10 minutes to maintain best quality moulds. The plastic has approximately the same viscosity as water and therefore DCPD easily fills in all the small spaces in the moulding tool. Out comes a perfectly shaped durable Bremen 3D8 loudspeaker part. All drivers are specially developed by Bremen and use a Titanium Voice Coil Former with symmetric air ventilation. This high tech solution ensures maximum rigidity which is essential for a linear piston-like movement and low loss due to eddy currents. Neutral Directivity: The directivity characteristics in Bremen Loudspeakers preserve each of the recorded instruments different natural directivity when being reproduced. Neutral Transient Response: The transient characteristics ensure a natural transient response of the recorded instruments. Bremen optimizes the loudspeakers being critically damped systems. Neutral Frequency response: The frequency response in all directions i.e. on both the direct sound and on the reflected sounds from Bremen loudspeakers preserves the natural tonal quality from each instrument. Wall mounted 2-way vented port (bass reflex). Dispersion: Half sphere 2π from the wall. Vented port tuning frequency: 36 Hz. Frequency response: 35 Hz - 25 kHz mounted on wall in room. Bass/midrange: One 5½” long-throw Midwoofer with titanium voice coil former with symmetric air ventilation. Treble: Two 1-inch soft dome Tweeters with silk fabric diaphragm and a unique 30μ Titanium voice coil former with symmetric air ventilation. Tolerances: Bremen 3D8 loudspeakers are matched to be virtually identical in each matched pair, with a frequency response tolerance within ± 0.5 dB. Sensitivity: 88 dB SPL (2.83 V/1m). Nominal Impedance: 4 ohm. Very smooth impedance curve above 200 Hz. Recommended amplifier power: 30-500W per speaker. Wall Brackets: Included is a Hangman wall bracket with a built in groove for the bubble vial. Connection terminals: Gold plated binding posts. 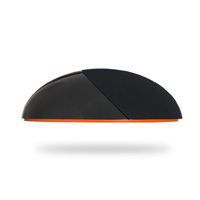 Maximum Dimensions: cm (inch”); Height: 54.5 (21-½”), Width: 37 (14-½”), Depth: 17.5 (6-⅞”). Net Weight: 10 kg (22 lbs). Colours: Shell: Tuxedo White. Soon to come: Piano Black, Silver Grey, Swedish Bronze, Italian Red. Back Side: Orange colour with soft lacquer. Front cover: Black fabric. Soon to come: Light Grey fabric.